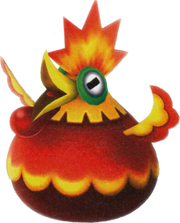 Cluckbooms are enemies appearing in Super Mario Galaxy and Super Mario Galaxy 2. They are chickens that lay eggs that explode after a few seconds. They are orange and black in appearance and have the ability to fly. A well aimed Star Bit can bring them to the ground for the player to defeat. They are only found in Dusty Dune Galaxy in the original game and the Slipsand Galaxy in Super Mario Galaxy 2. This page was last edited on June 17, 2018, at 21:43.